Many Muslimah’s like myself.. who are plus size struggle to find ways to be modest and be able to join in fitness activities. My main form of fitness for more than half my life was competitive swimming before I became Muslim and began to wear the hijab. The company sells rash guards in a wide range of sizes but their plus sizes had a greater range than I had seen else where online. So I purchased the Long Sleeve Rash Guard and Black Swim Tights to cover over the bathing suit I would wear underneath. 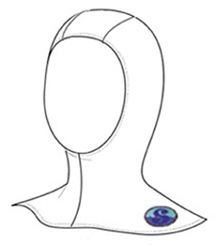 I found another company – Splash Gear -http://www.splashgearusa.com/ – Muslimah owned and operated in the US and purchased a swim hood to cover my hair. Viola! I had a plus size burqini.. or hijabkini.. The outfit itself isn’t as modest as others on the market – with the top not being tunic length and the swim pants being more like leggings. Yet it does the job..covers me up and allows me complete freedom of movement to get back in the water and swim , boogie board and who knows.. surf one day soon. Previous Post More Paperwork Drama!